Butterflies, it turns out, like hats. After a recent trip to the American Museum of Natural History, I inadvertently carried off a tiny part of the show. The Butterfly Conservatory at the American Museum of Natural History immerses you in the natural environment of butterflies and moths. 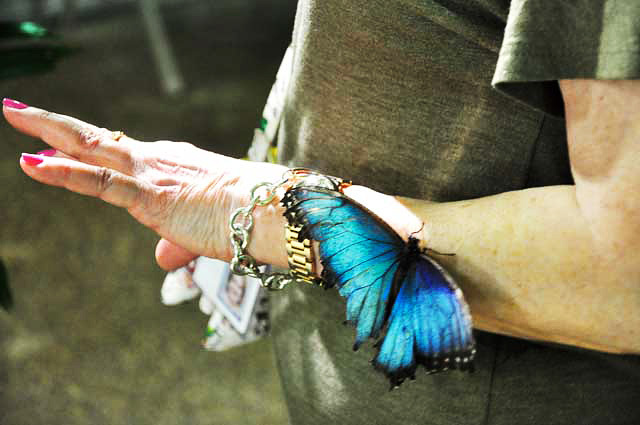 The exhibit – which features 500 free-flying butterflies — is held annually from fall through late spring. 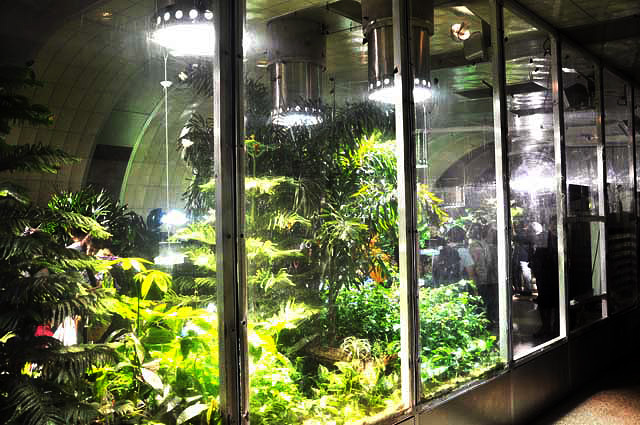 Entering the conservatory, the heat and humidity engulf you. According to an exhibit volunteer PK, the temperature is kept at 80 degrees and at about 80 percent humidity since the insects live in a hot environment. 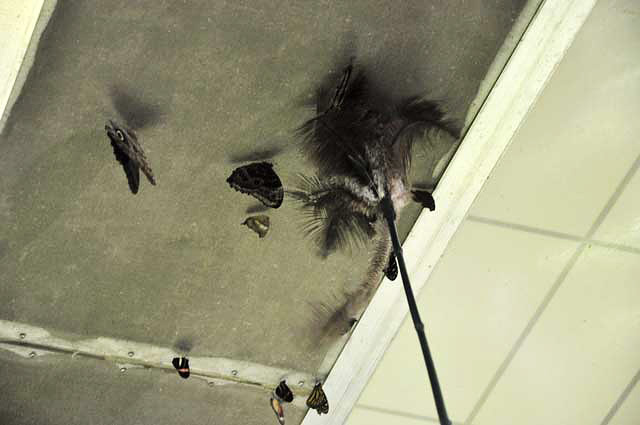 She uses a stick resembling a feather duster to bring down butterflies and moths that are at the top of the roof of the exhibit and won’t come down. “The insects tend to stay up there because it is warmer and I do that so they can come down so they won’t dehydrate and also drink water,” she explained. Exhibit volunteers spray water on plants so the insects can drink from them. Butterflies and moths are of the order Lepidoptera, which includes than 250,000 known species, 18,000 are butterflies. 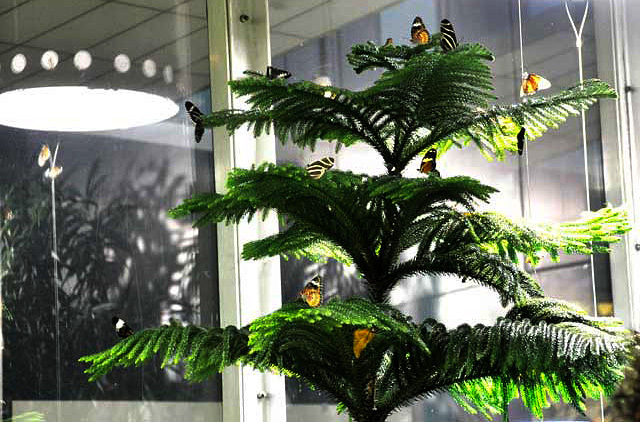 The exhibit features butterflies from three of the families. Each family has different physical features. The Papilionade butterfly is colorful and has tails on its hind wings. The Pieridae is yellow, white, orange and with black spots. The pigments that give them these colors come from the waste products in the body. The Nymphalidae are medium sized to large butterflies and are known as the Brush-Footed butterflies because the forelegs of the adults are small and hairy. The butterflies and moths are shipped from all over the world by mail to the museum. It receives 80 to 100 different species from September through May from Africa, South America, South East Asia, Australia, Costa Rica, Florida and “any place where is hot,” says volunteer PK. “The butterflies come from butterfly farms which is a big business. The museum receives butterflies that are in the pupa stage, one of the metamorphosis stages of the insect, because mating goes on at the butterflies farms. The four stages of a butterfly in metamorphosis process are the egg, larva, pupa, adult. The anatomy of a butterfly includes the head, the thorax or body section, and the segmented tail area that contains the organs. The wings are prominent feature of adult butterflies and moths. The difference between a moth and a butterfly is that adult butterflies are active in the day and most, but not all, moths are active at night. The moth’s antennae are straight or feathered and the butterfly’s antennae are thickened or clubbed at the tips. Visitors are checked as they leave the exhibit to make sure they don’t have any butterflies leaving the exhibit. There are mirrors at the exit. As I was leaving, one of the volunteers mentioned that butterflies like hats. I checked mine in the mirror but didn’t see any. I took a bus and then a train. No one mentioned anything until I got back to school and staff in the Academic IT center said a butterfly flew off my hat. Added by Christine Mckenna on March 18, 2019.